I said in an earlier article I would outline my Django deployment recipe. 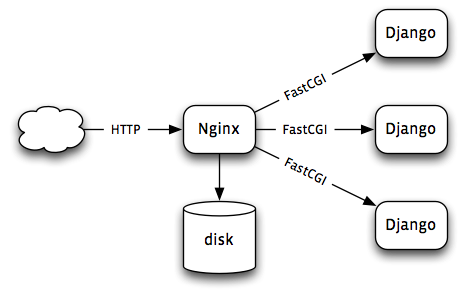 This is largely derived from a recipe for Deploying A Django Site Using FastCGI in the Django Advent site. I will carry on using http://jeremyday.org.uk/ in my examples. Static files—such as style sheets and images—are served direct from disk. Django only handles dynamic pages. Also install any other special packages. and I have a symbolic link from ~/Sites/jeremyday to the directory ~/Projects/jeremyday/static, which is where I put the style sheets and suchlike. In my current set-up, with only one server, this will just be another name for the one server I actually own, but in the unlikely event that demand for the site overloads the server, I can offload it to a separate server, or even a content-delivery network. So anyway, now would be a good time to edit the settings file to reflect production-only changes. I have adopted the convention on my server of numbering FastCGI ports starting at 9001, and jeremyday.org.uk as site number 2 gets port 9002. So now the FastCGI server is running; to see if it does anything useful we need to get Nginx to talk to it. Since I compiled Nginx from source, it lives in /usr/local/nginx on my server. I use Cog to generate the repetitive part of the configuration, but copy-and-paste would probably work as well. Each server gets three Ngix clauses as follows. This ensures it does not matter which URL people type in to their browser, but avoids having caching and statistics split between the two domain names. The second is the site itself. Mostly it is about handing over to Django via the FastCGI server. Looking at this now, it occurs to me that a production site there would be more caching and compression options specified. Now I should be able to visit http://jeremyday.org.uk/ and see the front page working perfectly. Or, as seems more likely, I can now debug the configuration until it works. Now the server is running OK but will not automatically restart should the server be rebooted. I could write an init script for this, or a script for Ubuntu’s replacement called upstart, but the simplest approach is D. J. Bernstein’s daemontools. The daemontools philosophy is that, instead of obliging all writers of servers to know how to detach from the terminal properly (which can be tricky to get right), you write a single program that does it right, and use it to daemonize servers written as ordinary programs. The Python command line is the same as the one I have just been testing. The rest of the script is essentially boilerplate for switching to the correct environment and user ID. Now I should be able to refresh the browser window to verify that everything is running flawlessly. One day I shall find typing these commands onerous enough that I shall have to look up an automation system like Fabric. But for the present, that’s how I update Jeremy’s web site.